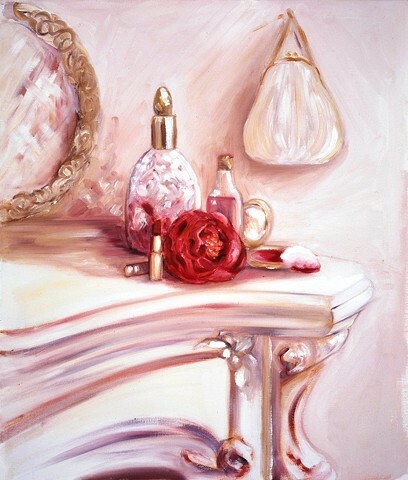 This painting of make up, perfume, a single rose and a silk purse was originall y commissioned by Camden Graphics for use on a greetings card. It's a great example of the kind of painting you could commission for a bride, with some of her favourite things. Whether it's her make up and perfume bottles, her bouquet and veil or a painting of her wedding jewellery and details from her dress, I'm more than happy to paint something for you to remind you of that special day. This painting was 60cmx70cm and would it cost approximately £185 to commission a similar picture. Just get in touch, and we can talk about what you might like to feature in your very own painting.